Eating in Disneyland can be a daunting task for parents given the excitement of the day and the impact of waiting in lines with kids on everyone’s nerves. Nonetheless, it’s an essential part of the journey as well as necessary to keep up your energy for all the fun! 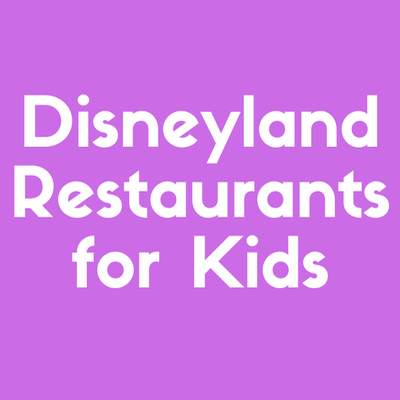 As a frequent visitor to the parks, I’ve found these are the places with the best food at Disneyland Resort when traveling with kids. The meals are generally easy to eat and quick to grab. I also aim for options with a lot of seating or that have food that easy to walk with between rides. There are also a few special experiences that are fun to do no matter your age! While there are plenty of places to pick up a hamburger (or cheeseburger, if you please), sandwiches and hot dogs in DLR, these four really hit the spot for everyone from kids to grandparents! Choose from classic beef patty meals or new-age vegetarian options at several of these locales. Across from Toy Story Midway Mania! at Pixar Pier in Disney California Adventure Park is Angry Dogs. You’ll recognize it as soon as you see Anger from Inside Out blowing up a hot dog stand with his rage! Seeing Anger blow up a hot dog is pretty funny at any age, and taking a picture with the exploding emotion will bring on lots of laughs for years to come. Plus, the Slightly Annoyed Dog features a classic beef hot dog and side of potato chips that anyone would enjoy. Check out the short menu here. It is also conveniently located along Pixar Pier, so getting from the cart into a line to finish a quick meal with be easy. Kids will enjoy not having to stop for food and sit down when they are excited and raring to go on the next ride. Rides nearby include Toy Story Midway Mania!, the Pixar Pal-A-Round and the Incredicoaster. If they’re not ready for rides, they can always opt to play at the carnival-style booth of Games of Pixar Pier! Angry Dogs is quick, cheap and convenient for a dining establishment in the parks. Plus, the spicy dog option gives adults an opportunity to explore a twist on a classic food usually made with kids in mind. Additionally, the location is central in DCA for Pixar Pier, making access to rides and food convenient. Located in Critter Country (past Splash Mountain) in Disneyland Park, the Hungry Bear Restaurant offers an array of treats from burgers to fried fish sandwiches to fried foods in general. It also features a Vegan Specialty Burger, so there are options for every palate. Purchase a one-of-a-kind Country Bear Jug with your drink of choice for an amazing souvenir! The food is absolutely delicious! Kids can enjoy a full-sized hamburger or cheeseburger or choose from a Power Pack (Disney Check Meal) with a smoothie, fruit and whole grain crackers or kids’ size hamburger or chicken nuggets meal. There are plenty of options for a wholesome meal to keep little ones energized all day. Plus, there are delicious desserts to share with the whole family. Kids will also get excited over the views on the river. Watch Davy Crockett canoes paddle by or wave to the passengers aboard the big boats making their way around the corner! The Hungry Bear Restaurant has a lot of seating for a quick-service establishment in Disneyland. While it does get crowded, especially during peak season, you can find tables pretty quickly either upstairs or downstairs or even just outside of the restaurant area. More importantly, if you have at least two adults in the party, you can have one order and pick up food without the kids while the other takes them to find seating. This often makes the process of setting up the meal easier as kids will be more entertained at a table than standing in (yet another) line. Adults will also enjoy the variety of flavors at the dining establishment. For those who recall it before the major renovation in the early 2000s, the Hungry Bear Restaurant has come to feature specialty dishes. Their menu includes a spicy chicken sandwich, a fish sandwich, a vegan burger and a BBQ chicken salad in addition to classic burgers. Plus, their desserts have expanded to include delightful funnel cakes! Check out the full menu here. The Red Rose Taverne, formerly Pinocchio Village Haus Restaurant, is an updated quick-service establishment furnished by Gaston. Antlers and scenes of a little provincial town can be seen in nearly every nook and cranny of the restaurant, making you feel as if you were in France with the motley crew! As “Be Our Guest” plays in the background, along with several other classics and their renditions, kids will love to point out paintings of their favorite characters and all of the elements that remind them of a classic (and recently remade) film. From the decor to the general atmosphere of being in a taverne, there is much to delight them as they finish some of the best kids’ rides in the world at Fantasyland. Plus, the food is truly delicious. While there is a complete menu for both breakfast and lunch/dinner, the kid-friendly options are great for little ones. Chip’s Dishes feature cheese pizza, a smaller hamburger option, a carved turkey sandwich, a Power Pack (Disney Check Meal) and even a toddler-size mac ‘n’ cheese. All of those favorites in one place makes for an ideal meal for the whole crew! Moreover, kids will go crazy for the desserts available at Red Rose Taverne. Though listed as a beverage, Gaston’s Famous Brew is a delightfully sweet punch featuring apple, mango and grapefruit juices with a fun foam topping that makes the perfect end to a meal. You can even get it in a souvenir mug! Plus, the Grey Stuff Gâteau will surprise them in a yummy way. While it’s grey exterior looks funny, the red velvet cake and raspberry filling will make them say, “it is delicious!” just like Lumiere. The food. Honestly, the food at the Red Rose Taverne is the main reason for a stop. Though the breakfast options are relatively standard, the rest of the menu for lunch and dinner features unique meals you won’t get anywhere else in the park. Starting with the vegetarian option, you have a Samosa Sandwich featuring a cauliflower, potatoes and peas patty. It’s topped with fried green beans, lettuce, a tomato compote and vegan curry mayonnaise. All of that on a toasted onion roll with a side of garlic fries makes for a great treat. Of note, it’s not very spicy; it is, however, very flavorful like a samosa. For the carnivores, there are French-inspired and traditional American options. Try the beef poutine for a flavorful stew or one of the many burger options for twists on the classic. No matter what you choose, be sure to try the Pommes Frites — crispy thin fries topped with a garlic mixture and parmesan. For the healthy conscious, there are also salad options. You can have chopped salad with or without chicken. Note that both menu listings feature baco, egg, apple slices and apple vinaigrette. In the end, there is truly a choice for everyone! Located just off Buena Vista Street as you head toward Grizzly Peak, you’ll find Smokejumpers Grill in DCA. Their food is as hot as the namesake of the establishment, offering a variety of sandwiches and burgers, plus delicious sides! Not only is it is close to the entrance and easy to get to when they’re hungry, but the food options are delicious. Little ones can pick from a chicken skewer, plain hamburger, grilled cheese or chicken tenders. Toddlers also have the option of mac ‘n’ cheese. Plus, with the “unlimited” toppings bar, they can pick their favorite sauces to top of the meal! Beyond the food, Smokejumpers Grill features cool decor. If your little one likes planes or the mountains or anything nature, this is the perfect place to look at fun photos and learn a little about California’s history with wildfires. Kids will enjoy eating inside if they like to look at fun decor. If they like being in the sun or just outside in general, they will also have that seating option, making it a win-win all around! The complete menu at Smokejumpers Grill has something for everyone. From classic hamburger options to BBQ-infused dishes, meat-lovers and vegetarians alike can enjoy the grill. Plus, because of the quick-service nature of the restaurant, large parties can break apart the responsibilities of getting food and finding seats, shortening the overall wait time for the party. Meat-lovers can enjoy everything from classic beef patties to chicken sandwiches to hearty meat chili. You can even get chili cheese fries as a side or starter for the whole table! Vegetarians, on the other hand, have a great option of BBQ jackfruit. Jackfruit is the latest and greatest protein-packed veggie option that has the consistency of pulled pork and takes on the taste of whatever seasoning you add. This sandwich is truly delightful and will make even the most skeptical drool over it. If you prefer to add more vegetables to you meal to make it a bit “healthier,” go for the toppings bar. I have made a full-on salad with dressing on several trips (no Cast Member has said I couldn’t) in lieu of eating a pile of fries. Note that there are no prepped salad options. Let’s begin this section with a great restaurant called The Golden Horseshoe. Nestled in the heart of Frontierland, Disneyland, The Golden Horseshoe is a testament to the 1955 opening of Disneyland. Featuring crazy shows and delicious food, your whole family will enjoy the antics of the saloon-style theater! Whether you catch a show or not, kids will love the french fries and chicken tenders. While there is a Power Pack option and a kids’ chicken slider meal, the appeal of comfort food is nearly irresistible no matter how young you are! Plus, there is a large variety of ice cream and sundaes that kids are likely to beg for at least once. The sizes are great for sharing. If you do decide to make it a dinner and show event, be sure to check the showtimes on either the Disneyland App or on the front door of the establishment. The Golden Horseshoe has had running shoes since Walt opened the park. It was actually a favorite of his, and the quirky sense of humor brought to the stage today by The Laughing Stock Co. will have your kids giggling right along. Humor at these shows is certainly kid-oriented, but there are adult-level jokes (just like in every Disney movie) that are G-rated and hilarious! There is great seating, easy access to food, a fun show and delicious meal options. 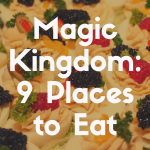 It’s literally a one-stop-shop that takes eating at Disneyland to a new level of fun. While there may be a line for the food, you can let your little ones explore the Victorian-style theater (with adult supervision) while you wait and order. Moreover, the adult food options are amazing given the simple nature of the establishment. Pick from fried classics or “chili mac” (vegetarian option available) or a salad. It’s a great variety that every member of the group can enjoy. For the full menu, click here. Located along the waterfront of DCA at Paradise Pier Gardens, the Wine Country Trattoria features delicious Italian-inspired meals for everyone. Plus, when you choose the World Of Color Dining package, you get a meal and amazing views of the show. You can also opt to make a late dinner reservation to catch the show from afar. For the full Disney experience and to make reservations, check out the pfficial online description. This package caters to everyone’s interests in getting a meal and show deal. Featured food includes a 3-course prix-fixe meal and non-alcoholic beverage for every participants. You can choose to eat at the Trattoria any time during their open hours.Plus, you get a voucher to the reserved seating/standing area at a World Of Color viewing! Don’t hassle crowds and lines to watch this amazing night time spectacle. Reserve a meal and the show for about $50 per adult. Not only is the food delicious with choices of spaghetti, chicken or fish meals or even mini pizzas, but the location provides great views of DCA. Kids will enjoy being close to the waterfront and across from Pixar Pier where they can see the endless opportunity of rides to hop on after their yummy meal. If you opt into the World Of Color package, kids will truly enjoy some of the best views of the show. With favorite music and scenes from a variety of Disney and Disney-Pixar films, kids of all ages will be singing, dancing and enjoying every moment of the spectacle. Aside from the delightful adult beverage choices, the Wine Country Trattoria menu features amazing appetizer, entrées and desserts. The ambiance of the establishment is also very soothing amidst the hustle and bustle of the park. Enjoy great views and photo opportunities with the whole family! Plus, you can have a premier opportunity to enjoy World Of Color that will light up your night. Let’s begin this section with the Carnation Cafe. Located on Main Street USA, Carnation Café pays homage to Walt Disney in several ways. From his portrait at the hostess’ desk to Walt’s favorites, meatloaf and chicken-fried chicken, you’ll truly feel as if you had met him! Not only does Carnation Café feature a unique menu for kids and adults, it is open essentially all day in the park. It’s a great option to get kids excited for the day with a delicious, comfort-food based meal, or to grab great seats for one of the parades by asking to sit next to the gate in the outdoor seating area (especially on less crowded park visits). The ambiance is also a great discussion-starter for the whole family, and kids will enjoy seeing old Mickey ideas and identifying rides they may have just ridden! Kids’ menu option are quite diverse throughout the day. A key feature for breakfast is Mickey-shaped waffles (with or without fruit toppings). Lunch and dinner options include smaller versions of classic comfort foods like fried chicken, hamburgers and mac ‘n’ cheese. Plus, you can always opt for healthier options off their Kids’ Disney Check Meals, designed for healthy eating to keep your little one energized all day long. Drink options are also appealing to youngsters with soda fountain choices and fresh lemonade. Don’t forget the malts and floats! The whole family can enjoy classic chocolate, vanilla or cherry malts or ice cream floats with a variety of soda (of course including root beer!). For a sweet treat on a cool night, there is also cinnamon-spiced hot chocolate. Comfort food. Plain and simple, the Carnation Café features the food that most of us wouldn’t eat on a regular basis let alone find the time to cook! Adults can use this as the perfect “cheat day” for any diet to enjoy chicken, meatloaf, pasta and more. Also, get fried pickles to share as they are truly a delicacy in the park! Additionally, if you are interested in a sit-down restaurant, there are a lot of options to keep your little ones entertained. The decor and photos throughout the interior will spark great conversation. Plus, the outdoor seating features a prime opportunity to catch a parade without having to stand on the sidewalk or save a space for long periods of time. With great views and delicious food, everyone will walk away from this restaurant satisfied! Another Disneyland Classic, the Plaza Inn is a great venue for everything from birthday celebrations to catching a parade or watching the nighttime spectacular. Featured food includes fried chicken and chopped salad. Plus, the buffet style of pick-up for your meal of choice makes getting through the process quick and simple. 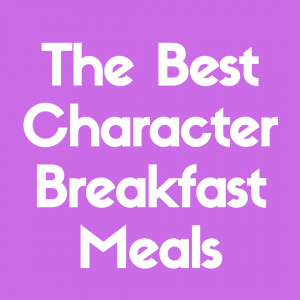 The food is delicious, the views are amazing and there is a chance of meeting a character throughout the meal any time of day! The secret here is that sitting on the left side of the restaurant (toward Tomorrowland) places you right at a premier Cast Member/Character entrance to the park. Generally, the lunch and dinner menu features an array of meat-based dishes like fried chicken, pot roast and tropical salmon. Kids are likely to enjoy the pasta options or their own selections of a Disney Check Meal featuring pasta marinara or a smaller kids’ portion of a baked chicken leg with mashed potatoes. Allergy-friendly options are also available — be sure to check-in with a Cast Member for the best options during your visit. Aside from delicious comfort food, there is the ease of getting the food and finding seating. While one or two members of your party head to the buffet line to pick up everyone’s meal choices, another can take the kids and find seating! This eliminates the wait required for a table-service restaurant while also ensuring everyone gets a break for just a little while by choosing a sit-down style meal. Moreover, the whole family will appreciate seeing characters, catching the music and glimpses of the parade going by, a decent view of some nighttime spectaculars and great photos of the castle. Plaza Inn features a unique package for diners looking to enjoy a special viewing of the parde along with an amazing meal. When you reserve this option, you open your day to an opportunity filled with amazing food and a special seat to watch your favorite Disney characters march along Main Street! Invest in this “meal and show” package for about $40 per adult and about $25 per child under age 9 to enjoy a lunch reservation and assigned seat for the latest daytime parade (2019 features Mickey’s Soundsational Parade). The meal features a drink, side salad, and pork chop or vegetarian pasta entrée for each adult participant. Kids will enjoy chicken tenders plus sides. Everyone gets a piece of yummy cake for dessert! Menu is subject to change; deliciousness is always featured. Character Dining with Disney is an amazing experience for the whole family. While it is only available at select locations and for specific meal times, park and hotel Guests as well as day visitors to the Resort can participate in the memorable experience. Reservations are typically required, so be sure to check online or on the Disneyland App for availability. You and your party can enjoy buffet- and family-style dining at several establishments throughout the Resort, each one offering a unique opportunity to meet with different characters. Pick from your child’s favorite friends to meet with Mickey & Friends or Disney Princesses. Here is a full list of linked dining experiences. 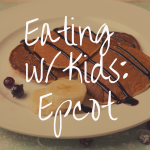 Not only will they get to meet an array of their favorite Disney characters, but kids will also love the Mickey-shaped food and other delicious treats that come with these breakfasts. With choices from waffles and pancakes to bacon and eggs, there is something for every kiddo (picky eaters, included!) at the buffets and family-style meals. Characters do vary and are subject to change at these opportunities. 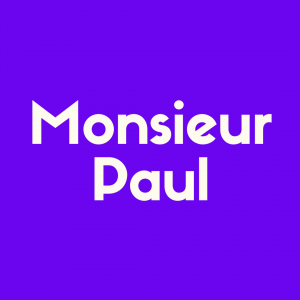 However, there is a general consensus among top-rated Disney blogs, like Mickey Visit, that the titles of the Character Dining experiences indicate the characters who are likely to come for a visit. So, for the Disney Princess Breakfast, you’ll likely encounter Cinderella, Belle, Ariel, Snow White and the like. 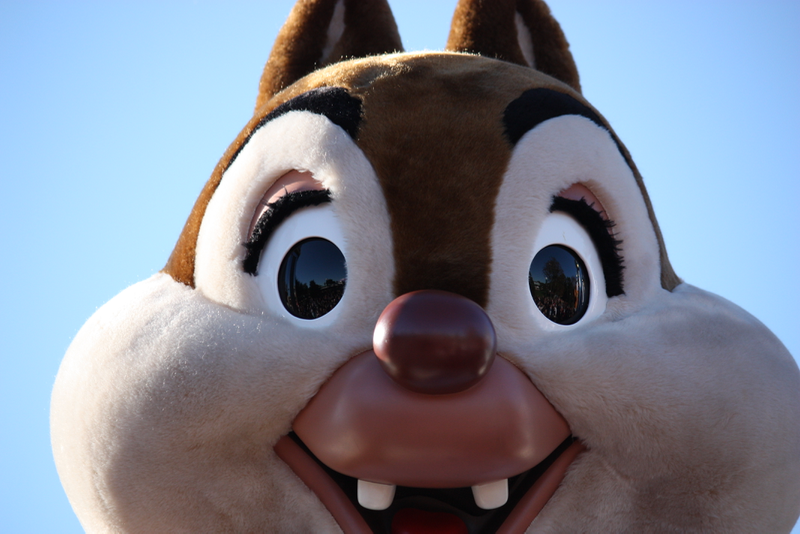 For Mickey’s friends’ breakfasts (Minnie at Plaza Inn, Donald at PCH Grill, Morning Giggles with Goofy, and Mickey’s Tales at Storytellers), you will most likely meet the whole crew plus other classics like Chip ‘n’ Dale and Pluto. You may even get more modern friends joining you like Stitch at PCH Grill and Peter Pan at Plaza Inn. It will depend on the day, so be sure your little on is prepped! Another big perk is getting one-on-one photos with characters without a line. Kids will love getting the more individualized attention plus an autograph from their favorite Disney friends! The dining experience is all-inclusive. Not only does everyone in the party get delicious food and beverages, but they also get a chance to encounter characters. This means fewer lines for character photos in the park as well as more personalized encounters for you to take as many photos of as you wish. Plus, the food is delicious for everyone. While there are kid-oriented plates, there are even more adult options! 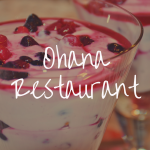 Choose from made-to-order omelet stations and make-your-own parfait stations at buffet experiences or delightful “royal-sized” meals for table-service experiences. Most of the breakfasts feature vegetarian options, too. Disneyland Restaurant reservations are highly recommended for all table-service restaurants and special packages or experiences. For a complete list of establishments within Disneyland Resort that accept reservations, click here. 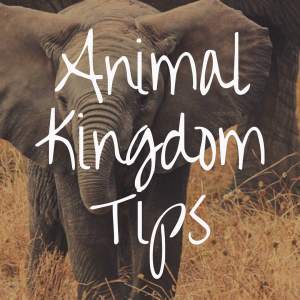 Here’s how you can make the magic happen! Note that arrangements can be made up to 60 days in advance. You can either go online (click on your restaurant of choice, locate the blue box that says “Check Availability,” and submit your preferred time, date, and party size to book) or call 714-781-DINE (714-781-3463). For some restaurants, you will be able to book through the Disneyland mobile application (more on this below). Of note, if you’re staying in the resort, there is preferred reservation access to some dining establishments for hotel guests. For these arrangements, you must make them in advance by at least two days. You can also use the online functions or call-in for some of the restaurants in the Downtown Disney District. Mobile Food & Beverage Ordering is available at select quick-service locations. No matter where you are in DLRt, you can select your nearest or favorite available restaurant via the Disneyland mobile app to order food on-the-go. This function makes getting snacks and quick meals easier and faster for those who want to ride every attraction on their must-do list! To order through the mobile system, choose the first available pick-up window or your preferred later pick-up time at the site. Then, connect your credit card information and order your food and beverages. Show up at the set pick-up time and pick up your order. In the end, you want to make your day as magical as possible. Participating in these experiences and options will help you make any Disneyland trip memorable!